A passion for writing is there within everyone, no matter whether they like it or not. Once someone begins writing then they keep on going. However, there are many passionate writers like you and me around us who are born with a pen. Such people are desperately looking for some kind of platform to showcase their piece of art. If you're are one among that someone, then today you are the right place and here I will give a complete guide to pursue your dream of writing. Apart from pursuing your passion, writing great eBooks and publishing them on popular websites is also a great business opportunity to look into. For example, if you're already a passionate Blogger who pursues his passion for writing through blogs, you could only earn a few hundreds of dollars through it even though you have done an unmeasurable amount of backstage work for creating that short piece. However, by publishing just one premium eBook, you can earn ten to twenty times of that money in a shorter period and continue earning as long the eBook is up-to-date. Apart from that, creating an eBook will also make you an expert in your field. Thus helping you to create a name for yourself in your related field. Even if you are a starter, by publishing your eBook you can get some attention and fame and thus increase your blog popularity too. This is because the chances of your eBooks appearing on the websites alongside that of some biggest authors are very high. The first rule of writing eBooks that you should always keep in mind is that you need not be an expert in order to publish an eBook. You can literally write anything you are passionate about. The topics are completely up to you. Although there are a variety of topics to choose from, I would suggest you choose a single category in which you think you are expert or passionate about. Once you choose your niche category, try to stick with it everytime you publish one. This will help your readers to find another eBook related to the same field. The second rule is to take time. Unlike writing articles for magazines or publishing blogs, writing an eBook is not a one-night job, rather just like publishing a paperback book, the author of eBooks also has to take nearly equal efforts in writing it. Take your time, research on it, re-research, write & re-write, edit & re-edit until you are completely satisfied with it. Once you complete writing your eBook, your next job is to read through it completely for at least three times. This will help you in eliminating many of the errors and will even give you a better way of writing some of those incomplete sentences. Once you have done this job too, you can go for asking help from some of your friends and families who're into reading, to review your first eBook. Let them take their time and don't push them to complete fast. Once they've finished reviewing, patiently listen to their opinions. If you find them to be relevant, add necessary change to your eBook and go through it once again. Now it's time to find an attractive cover for your eBook. You can either design one yourself, or could ask help from anyone you know. Or you can even do the design work from any book publishers by paying for it. For the design of the cover to be perfect, it should always match with what you're writing about. It will be helpful if you go through some of the best selling eBooks that are similar to your topics in order to get some idea of how to design an eBook cover page. When you get an idea on designing one, you can proceed with it by following the steps mentioned above. So that's it, your first eBook has been successfully completed. Now it's time to publish it on some of the popular websites. 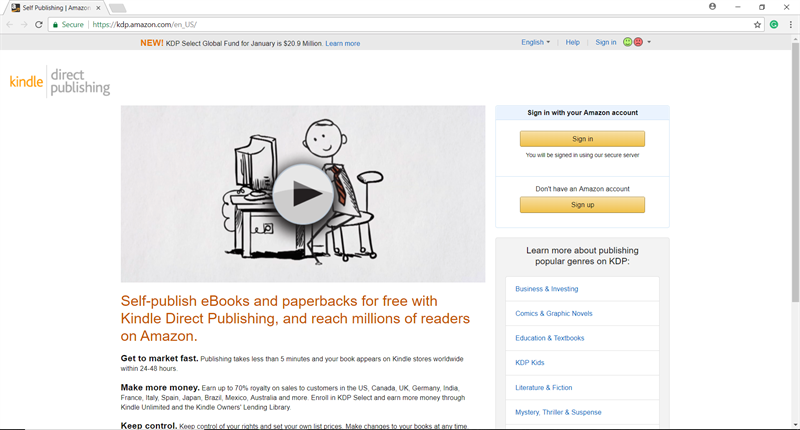 One of the best platform to sell your eBook is the Amazo's Kindle Direct Publishing or KDP. This one is highly recommended and listed first because of the advantage that it's one among the largest online sources for eBooks. KDP allows its users to self-publish their eBooks and it will then be made available on Kindle apps on various platforms like Android, iOS, and Windows. With Amazon KDP, you can publish your eBooks for free and Amazon shares with you up to 70% of the profit and keeps rest as a royalty fee. Play Books is yet another great eBook digital platform from Google to publish your eBooks for free. If you're more of a Google guy and would love to keep things simple, then this will be the best platform for your action. 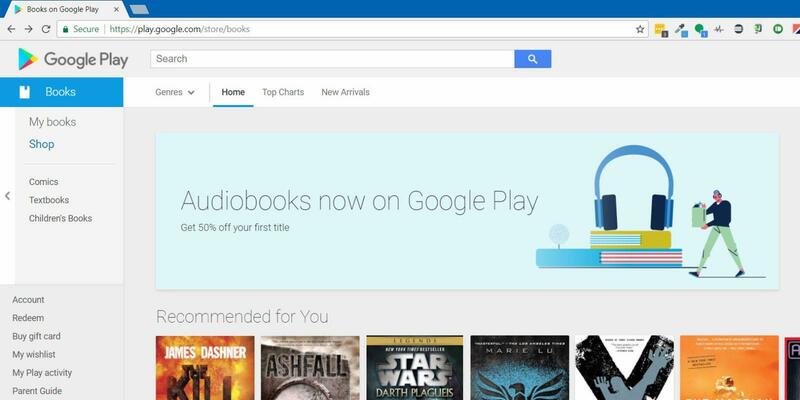 Just like the Amazon KDP, Google Play Books also let you upload your works, set price for them, showcase it to the readers from around the world and earn some real money. Don't want to waste time on your eBook adjusting font, layer, headings etc.? Then there is Draft2Digital that will help you in the stressful and complicated formatting. For things to work smoothly, you just need to create a free account and upload your content. It's really that simple. A great online eBook creator with lots of amazing features to offer; it's something we can tell about Blurb. Just like Draft2Digital, Blurb also helps their users with the formatting works according to your wish and like. There are also a lot of tools that will definitely help you in creating a perfect-looking eBook. 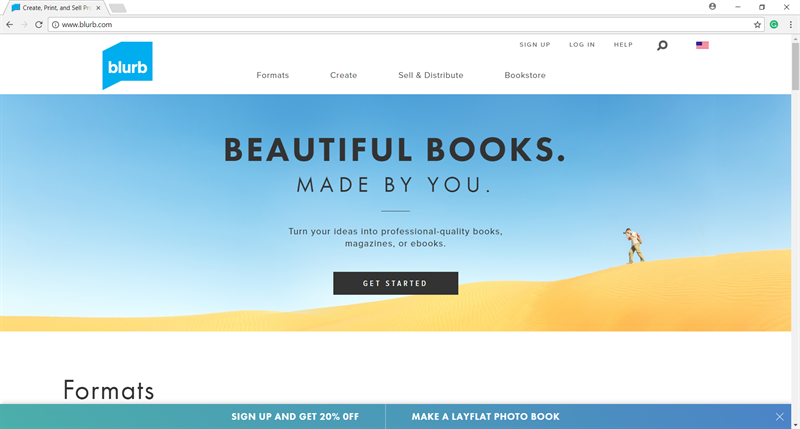 Although this is not a Platform for starters, as it costs money for most of their services, Blurb is the best choice for those who are seriously looking for creating a professional eBook. 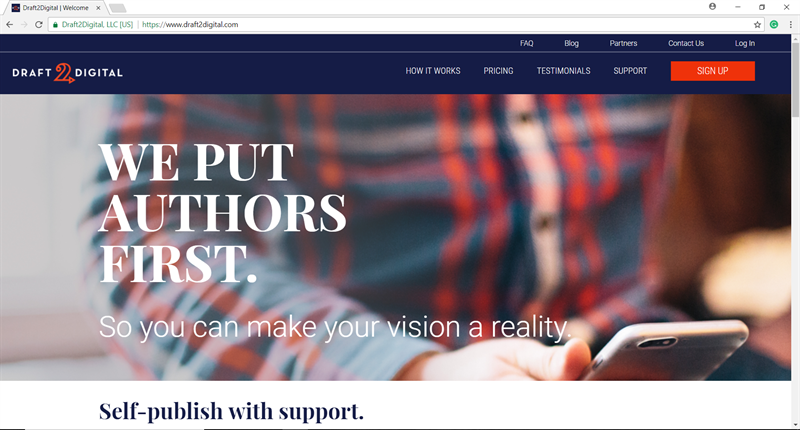 Just like Blurb, Lulu is also a fabulous eBook creator that will help you create a perfectly formatted eBook. However, unlike Blurb, Lulu offers you these services with a comparatively very low price. Thus Lulu might be the better option for starters to create a professional eBook at low cost. 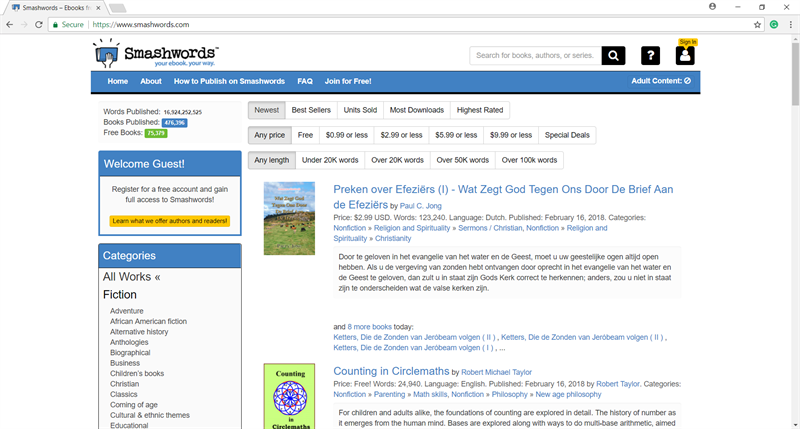 From publishing to editing and formatting, everything is free on Smashwords for its users. 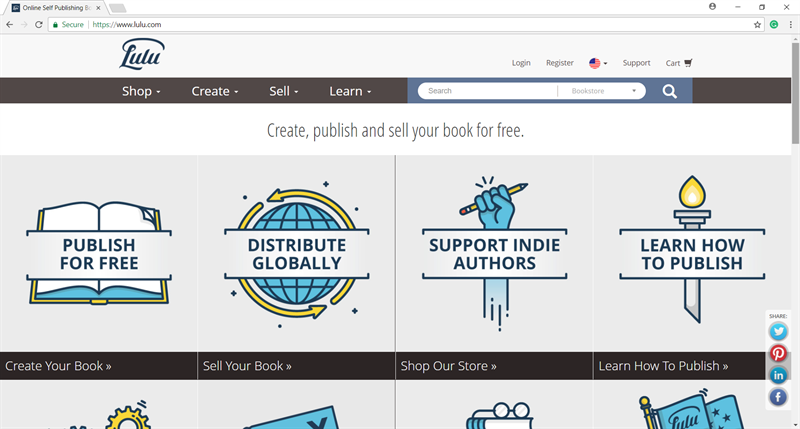 Moreover, users also get an opportunity to sell their eBooks between multiple distributors including Overdrive, Kobo, Barnes & Noble etc. Although you will get to earn up to 80% as royalty, you'll only get up to 60% if you eBooks are getting sold by the distributors. From any of the above-mentioned websites, you can create a free user account. The first step you need to do right after it is to research the site and study how it works. The areas that you need to include in your study are the payment methods, royalty share, tax information etc. Although many of the above-mentioned websites work on a similar basis, you still need to keep your side clear. With that being done you can upload your work directly if you already have it prepared. Your work isn't completed yet, rather the most important step is still unfinished which is promoting your eBook. Through promoting, righting short reviews and asking other fellow bloggers to promote your content, you can drive more people to see your eBook and if it is reasonably priced, then the chances of getting it sold are more. Admit it! We aren't a superhero who could do everything perfectly even at the first time. Since we all are average human beings, we are prone to do mistakes. But the wise option is to always look for possibilities of making mistakes, learn from others mistakes and choose your path accordingly. So here are some common mistakes that many of you might encounter while publishing your first eBook. For things to work flawlessly you should always go for topics that you're proficient in. However, if there is no such topic around, then your next best option is to follow your passion, as passion can bring you hunger to know more about that particular area. Choosing topics that you either know little or know nothing about, can lead in making huge errors which may negatively impact on your eBook reputation. Moreover, choosing such topics aren't ideal as you will definitely need to spend a lot of time and effort in creating the eBook. Although you're creating your eBook to start a new business opportunity, your aim shouldn't get limited to profit alone. Always concentrate on creating unique and quality stuff and fame, money and success will automatically follow you. No matter you're starting to write your eBook on paper or on Laptop, don't start right away. You need lots of planning before you start writing your first eBook. So I would suggest you to first take a pen & paper and start noting the planning strategies and ideas for your eBook. Only sit to write when you feel like writing. That means don't sit to write with a stressful or exhausted mind, that will only help in ruining your whole writing career. Instead always sit with a calm and peaceful mind which will not only make you happy while writing but also will help you write contents with an open mind. So that is it! You have got a complete guide on how to create your own eBook and earn money online. If you have gone through the above guide on eBook publishing and earning money, then you have crossed half way. Now it's with you to start working on your first eBook to get published online. Always remember that every successful story has a dedication story behind it. So don't lose your hope or dedication at any point while writing your eBook. Also be consistent in what you are doing even it is a single small step towards your new career and day by day, also try to achieve more and more goals. Always aim high and work hard. I wish you all the very best for your journey to the new platform and happy eBooking.